Instant Imprints O'Fallon, MO | Custom T-Shirts, Embroidery, Signs and More! At Instant Imprints O'Fallon, our customers come to us when they want to be more visible to their customers. We create that visibility five different ways: Branded Apparel (embroidery), Signs & Banners, Promotional Products, Custom T-Shirts and Print Services. My stadium chairs look fantastic. Thanks again for your awesome craftsmanship, reasonable pricing and professionalism. I'll be sure to refer all my friends and family to your establishment. Great job Instant Imprints Staff! Are you looking to promote your sports team, an upcoming event or your local business? Instant Imprints in O’Fallon has everything you need to bring you the visibility you need! Our custom t-shirts, printing services, promotional products, custom banners and branded embroidery items are of the highest quality, meaning that you can represent your business or team in a superior way. Creating custom apparel and promotional items has never been easier with the help of a local Image Expert. Whatever your visibility goals are, let Instant Imprints in O’Fallon be your promotional partner! Instant Imprints in O’Fallon is proud to serve Missourians with the tools they need to promote their businesses effectively. We fuse together the quality that only a global industry leader can provide with the personal touch that our local Image Experts provide. That means you get a world-class finished product, completed with an unsurpassed attention-to-detail and understanding of your product. Just ask your smart speaker, “What’s the best print shop near me?” and you’ll be sure to find Instant Imprints in O’Fallon! Across the great state of Missouri, savvy business owners know the power of custom t-shirts to turn heads and drive business. Whether you’re looking to promote an upcoming event, memorialize a past one, promote your new product or push your brand as a whole, custom tees are a great way to get the word out. T-shirts make great giveaway items to attract new customers, or you can list them for sale as a way for your most loyal fans to show their support. No matter how you choose to use your custom t-shirts, Instant Imprints in O’Fallon provides you with the highest quality custom tees around! Custom signs and banners are one of the most tried-and-true forms of advertising out there, and for good reason: they help businesses stand tall and rise above the competition. Our custom sign and banner service is second-to-none, with the latest and greatest production processes available. On top of that, your O’Fallon Image Experts are happy to help you choose the right combinations of colors, fonts and materials to make the most of your promotional campaign. 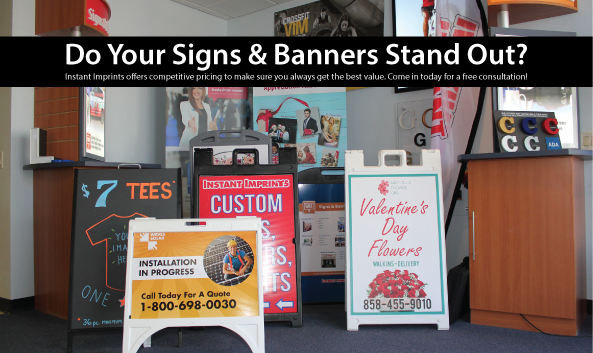 Your sign or banner is crafted from start to finish under one roof, right here in O’Fallon! When you’re ready to take your promotional power to the next level, stop by our showroom on Winghaven Blvd, give us a call at (636) 561-9210 or request a quote online today!